The Society of Medalists was world-renowned for its collection of medals crafted by some of Americas most prominent sculptors. The artists recorded history and central humanitarian themes on both sides of medal, often creating extremely valuable pieces. Pickle Barrel currently has 3 medals, each with their own artist story behind them. Laura Gardin Fraser grew up in the suburbs of Chicago and the coastal town of Rye, New York. She first learned to sculpt from her mother, who was a prominent painter of still life. She went on to join the Art Students League, where the young socialite caught the interest of her instructor and future husband, James Earl Fraser. Laura Fraser had begun to win large commissions that further established her place in the elite New York artist community. Perhaps her most famous pieces were the 1936 double equestrian statues of Generals Robert E. Lee and Stonewall Jackson in Baltimore. She was the only woman of six sculptors competing for the commission. Anna Hyatt Huntington had a fascination with animals—one that was inspired by her father Alpheus Hyatt, a professor of paleontology and zoology at Harvard and MIT. Her formal studies included apprenticeships under Henry Hudson, and then Herman Atkins and Gutzon Borglum at the Art Students League of New York. She would also often travel to zoos to study animal anatomy. She is recognized as one of the most prestigious female sculptors of the era. Her works are featured in the Metropolitan Museum of Art, Columbia University, Central Park, The National Academy of Design, The Hispanic Society, and many others. Anna and her husband Archer Milton Huntington also started 14 museums, 4 wildlife preserves, and donated 800 acres of land to the Collis P. Huntington State Park in Connecticut. Hyatt channeled her love for wildlife in the 27th Society of Medalist issue. 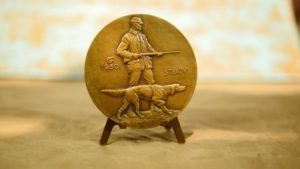 The 67-year-old created vivid scenes within just two sides of a medal. 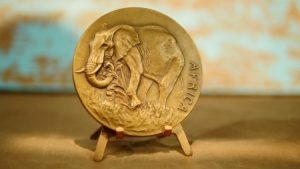 One side depicts an African Elephant eating in a field, while the other is various animals around a watering hole. James Earle Fraser was raised in Winona, Minnesota during the late 1800s. He studied at The School of The Art Institute of Chicago, moved to Paris to attend École des Beaux Arts and the Académie Julian, and apprenticed under Richard Brock and Augustus Saint-Gaudens. The Midwest, the frontier life, and the struggles of Native Americans were all themes of his early work. Some of the most famous pieces being the Indian Head Nickel and End of the Trail. If you have been to Washington D.C., then you have seen a piece sculpted by James Fraser. He played an integral part in the development of artwork within the area by sculpting The Art of Peace, The Authority of Law and The Contemplation of justice. His papers are held in the Syracuse Library, the Smithsonian, and the National Cowboy and Western Heritage Museum. 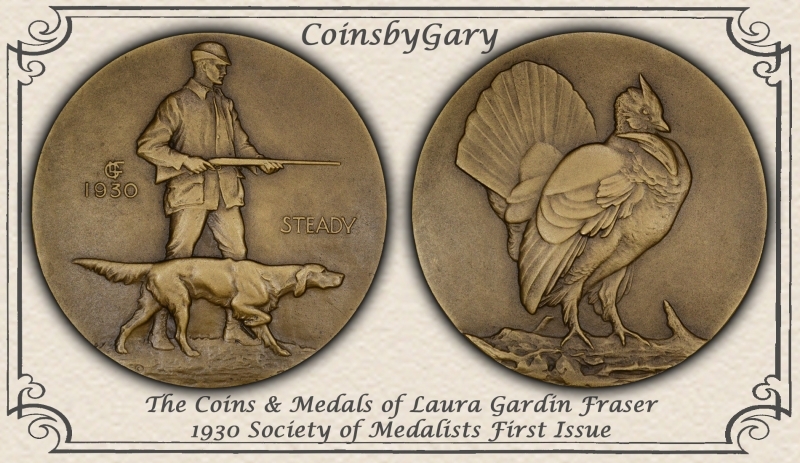 Following his wife Laura Fraser, James Fraser was selected to craft the Society of Medalists 45th issue in 1952 at age 76. 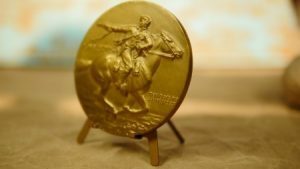 He had chosen to reference the themes of his childhood by depicting the Pony Express on one side of the medal and the explorations of New Frontiers on the other.